As I mentioned in my previous review, a few days ago I asked for suggestions about what beer I should drink for my 150th review. 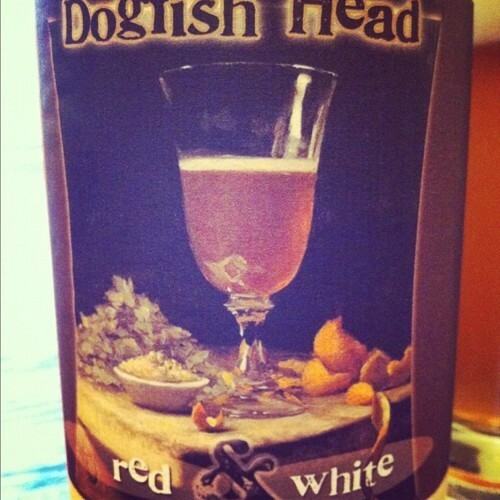 lifeasamusical asked for Red & White by Milton, Delaware’s Dogfish Head — I have another beer in mind for my 150th, but since this was requested, I will go ahead and gladly review it. Straight up honesty: I’m going to try to be as impartial as I can on this review, but I have had this beer before on numerous occasions, and it is exceptional. Red & White is a Belgian-style witbier, brewed with coriander and orange peel, and fermented with Pinot Noir juice. This is a blended beer, with 11% of the concoction aged on Pinot Noir barrels while the other 89% spends some time on oak barrel staves. 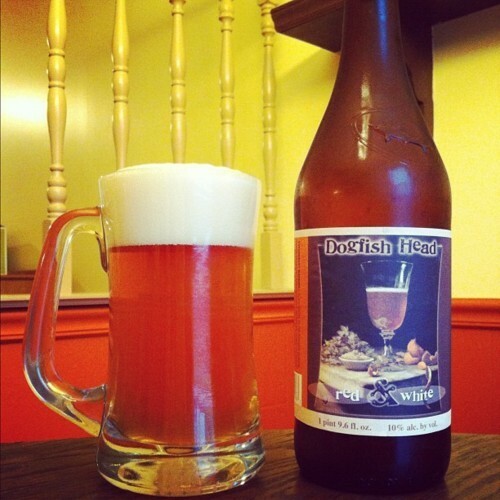 This beer is a limited release from Dogfish, and comes out every February in the big 750 ml bottle format. Coming in at 10% ABV (alcohol by volume), Dogfish’s Sam Calagione came up with the idea for Red & White while attending a wine dinner. He wanted to make a beer that had vinous qualities; according to Sam, whenever there is peanut butter and chocolate in the same room, he’s going to mix them. The pour brought forth a beautiful golden orange sunset colored beer, topped with a large bright white head, soapy in texture and composed of large, tight bubbles. The body of the beer was slightly clouded but had no particles or sediment. 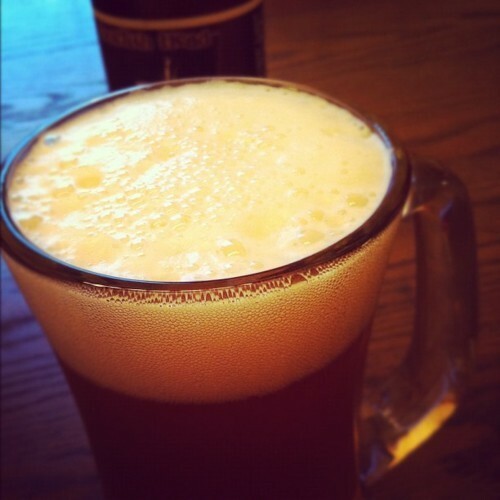 And right from the first diminish of the head, the lacing was spectacular; thick, solid sheets running down the glass. This is one impressive looking beer — you’ll want to grab the glass and see what’s going on here. Aromatically, there’s a ton going on here. The first thing my nose noticed was some fairly thick whiffs of background hop — grapefruit and pine, which surprised me. Then there’s a big blast of orange, coriander, and a slight suggestion of clove; this one is grainy and has a definite funky yeast presence, along with a wine quality that reminded me more of a white wine than Pinot Noir. Speaking in general terms, this one is also a touch boozy, and has hints of spice and sweetness. Red & White is a difficult beer to describe on the palate. There’s just so much going on here, and although this is a hugely complex beverage, none of the flavors are muddled, lost, nor is any one more dominant than the other. You get the orange up front, along with the coriander. 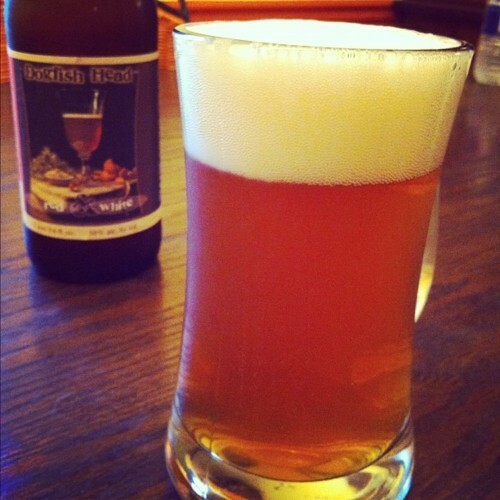 It starts out very sweet, but the mouthfeel isn’t overly sticky, it’s more creamy. The middle of the taste offers a graininess, then opens into the Pinot Noir-like finish — think the conclusion of a red wine mixed with orange peel, and when combined with an alcohol warmth that hits the back of the throat, you’re left with a bittersweet finish that just brings a smile to your face. Oh, and there’s hints of oak, too; see, I told you…there’s just a ton going on here. True to form, give this beer to a wine lover and see what happens. I think you’ll have a winner. Honestly, out of the powerful Dogfish Head repertoire, I think Red & White might be their most overlooked and unappreciated offering. This beer just delivers in all categories, and I know I look forward to this release every single year. In fact, I would love to see what some age would do to this beer, but I can never keep my bottles around long enough to find out. 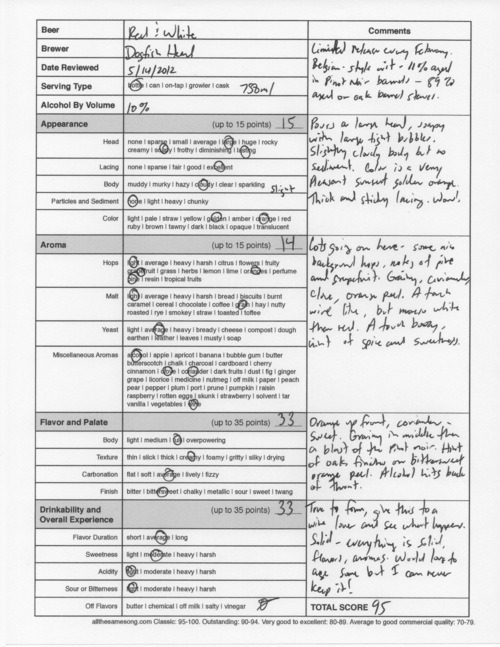 Dogfish Head Red & White, 95 points. Price: $13.99 US for one 750 ml bottle.